Highly accurate I2C BME280 temperature + humidity + atmospheric pressure sensor offer a stable ultra low power platform for an environment sensory board. Can be stacked directly with Moteino and MoteinoUSB (not on MoteinoMEGA). Onboard battery monitor from VIN, reading on A7, through a 2/3 (1MEG+2MEG resistor divider). Unpopulated Si7021 pad allows soldering that sensor yourself if you'd like. See the new WeatherShield Guide here! An example of reading values from this sensor board is posted in this RFM69 library example sketch. Also the MotionMote sample sketch illustrates reading the BME280 sensor. 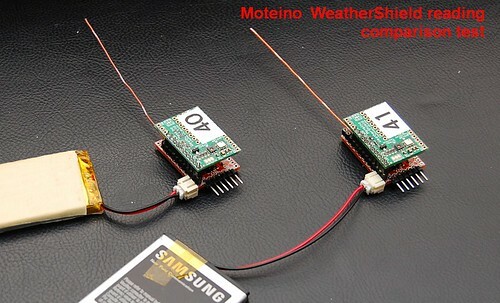 For reference only - a sample WeatherShield R1 wireless sketch to read and send weather data (from Si7021 & BMP180) via RFM69 to a Moteino Gateway from this sensor is also available here.